This funny cat drawing is the perfect model to start practicing drawing using a vector application! The design is simple, the colors are bright and the effects are quite easy to reproduce. It's the cutest cat you could find! 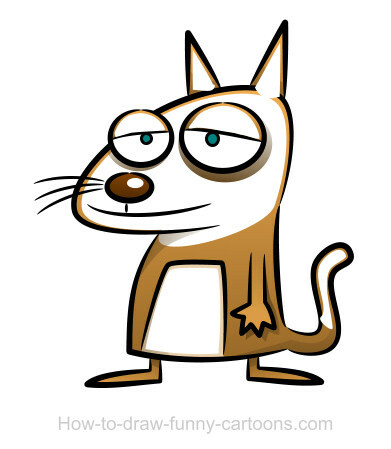 Just grab a pencil, sketch the cartoon character on a piece of paper and then convert your drawing into a digital to create the vector version. 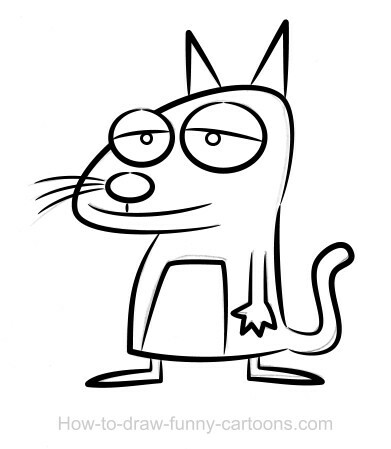 You'll see that drawing a funny cartoon cat is not as difficult as it might seem! 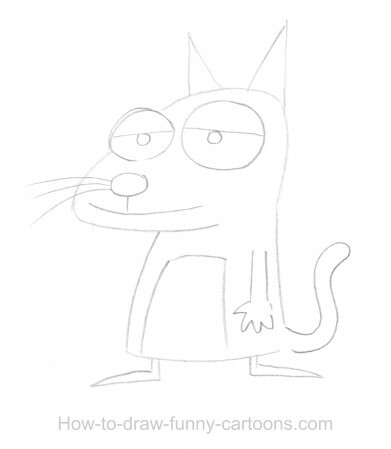 Let's start with sketching the cat on your piece of paper. Start with creating two large circles to represent the eyes. Noticed that the one on the left is slightly smaller. Once you are finished, draw the body and the feet of your cartoon character. 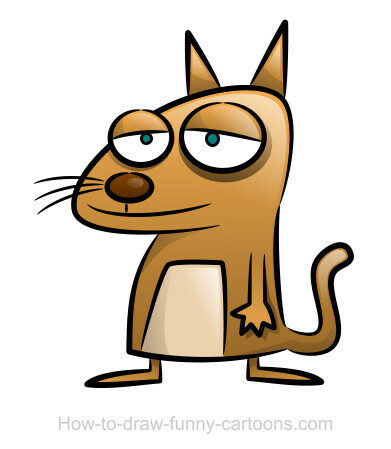 Complete this step by adding elements like the ears, the pupils, the mouth, the whiskers, the hand, the tail and the large patch on the stomach. My goal was to create a unique character with a funny head and a lazy attitude. Now draw the outlines using thick black lines with irregular width on both ends. I love this pattern because the result is more dynamic. It's a good trick to help the eyes follow a certain path. Add plain colors to your cat drawing by adding shapes below the outlines that were created previously. A good trick would be to duplicate and close the lines already available to create new shapes. Of course, you can remove the outlines from these new shape. Use the gradient tool to add a simple shadow on all elements of the cat. Make sure that the top part of each shape is brighter. The result is already nice, but we can do better by adding new shapes and creating stronger effects. So let's create new shapes on the ears, the eyes, the neck, the body, the patch, the tail and the legs. Use a color similar to the one from the body, but slightly darker. Select your gradient tool to hide the top part of each shape. You should end up with a shadow that is lighter and more subtle. Now that shadows are done, let's create a few reflections on the body of our cat drawing. Duplicate the head, the ears, the top part of the tail and the patch on the stomach. 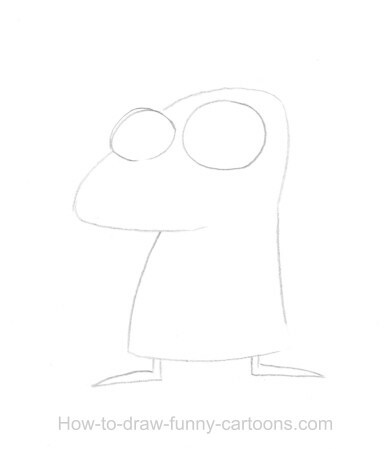 You can also add a circle on the nose of the character. Once everything is duplicated and/or created, select the transparency tool to hide the bottom part of each shape. Great! You should have a nice character filled with great shadows and nice reflections by now!